It is the Pro 2 2500 that ultimately gets the winning vote from us, because you get the benefit of a travel case in the box. With the inclusion of the travel case and price being the only significant difference between the two models, either are good buys, it is more about what is right for you and what the price is at the time of purchase. More often than not, it is the more premium Pro 2 2500 that is cheaper than the Pro 2 2000. The Pro 2 2500 comes with a travel case in the box whereas the Pro 2 2000 does not. The Pro 2 2500 comes with Black/White and Pink/White colour options compared to the Pink/White and Blue/White of the Pro 2 2000. Brush heads provided (subject to model). The Pro 2 2500 is technically the expensive option, but most of the time it is cheaper or there is little in the way of real price difference. Please note: High street and online retailer Boots, have a different variant of the Pro 2 2500. Instead of a travel case, a tube of Oral-B’s Pro-Expert toothpaste is included and the brush handle grip colour is Blue. We consider the travel case more desirable than the tube of toothpaste. In 2017 Oral-B launched the Pro 2 2000 and the Pro 2 2500 which we are comparing here. These are replacements to the Pro 2000 and the Pro 2500, note the extra ‘2’ in the product name for the newer models. 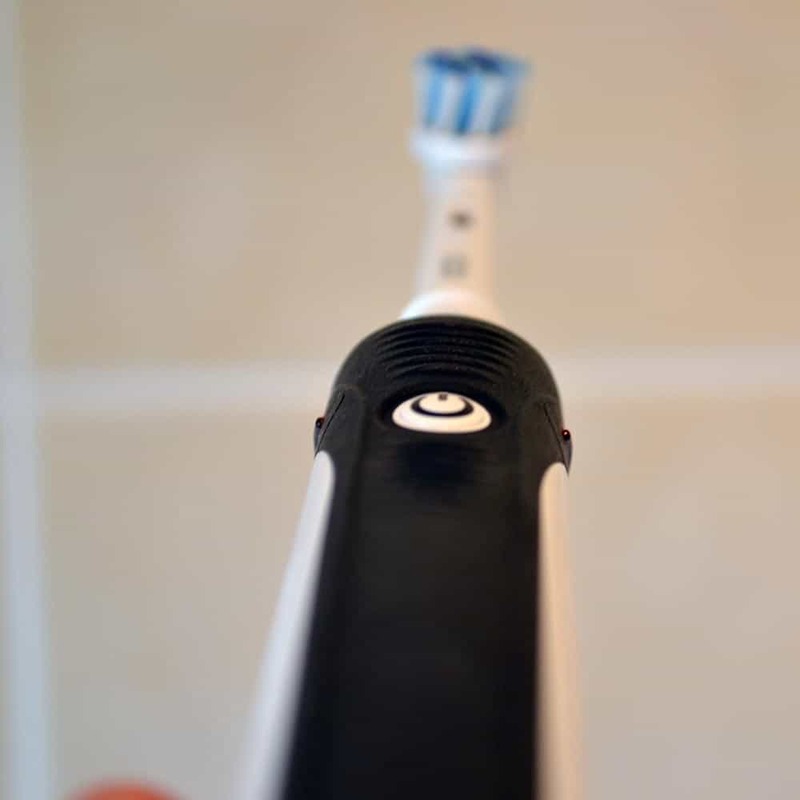 Detailed Comparison: What’s the difference between the Oral-B Pro 2 2000 and Pro 2 2500? OK, so let’s be clear from the start here the differences between these two models are minimal. 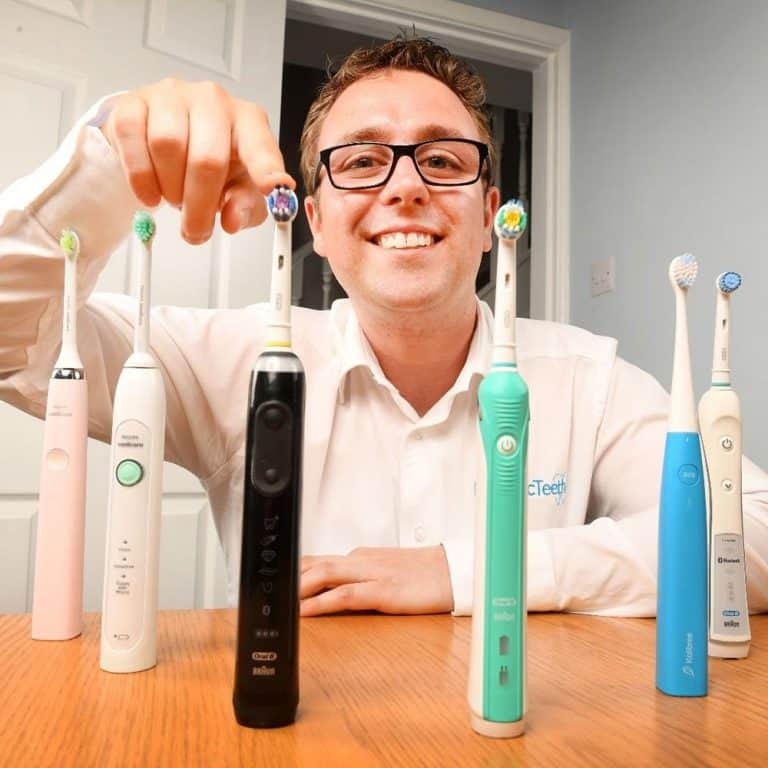 It is very easy to get confused with the array of different options available from Oral-B, so you need to pay attention to ensure you are getting the right brush for you. Technically, the Pro 2 2500 sits above the Pro 2 2000 in the range as it offers more in the box. With the 2 2500 you get a travel case included. A fairly basic but functional affair, the case is made from a clear plastic. Hinged on the left side 2 halves of the case come together to lock tight and provide a relatively strong travel case, despite the relatively limited thickness to the plastic. Curved from most angles the case holds the brush handle and up to 2 brush heads. Functional for the backpacker to the businessperson, it does not have the level of quality and premium construction some might desire but it does the job of avoiding accidental activation and keeping the brush out of contact with other items in your bag. Aside from the travel case, the other key difference is the handle colour. The physical size and features of the brushes are identical, but the colours are different. Made from a gloss white plastic, the Pro 2 2000 comes with either a blue or pink rubber grip that runs down the front of the handle, contrasting against the white plastic; whilst the Pro 2 2500 comes with either black or pink rubber down the handle. Hopefull,y this all makes sense so far. Another slight difference is the brush head that comes provided. Both models will come supplied with 1 brush head as standard. However, there are different package options where the brush head provided differs. The same principle applies to the Pro 2 2500. The letter at the end of the model number depicts the brush head it comes provided with. Therefore a retailer may sell the Pro 2 2000N and the Pro 2 2500N both of which come with the CrossAction brush head. The differences between the brush heads are explained in our ultimate Oral-B brush head guide, if you would like to know more. I should point out lastly, that often (but always subject to change) the Pro 2 2000W or Pro 2 2500W will be the pink/white handle whilst the Pro 2 2000N/S will be the blue/white and the Pro 2 2500N/S will be the black/white handle. As a result of the case being included, it is generally the Pro 2 2500 that is marginally more expensive the the Pro 2 2000. The Pro 2 2500 has a recommended retail price of £79.99 but is generally available from £30-£40, compared to the RRP of £69.99 for the Pro 2 2000 which is normally available for £30-35. Either are good brushes and it’s personal opinion which is right or best for you. You can purchase different brush heads and even the case separately if you require, so you are not limited should you decide in the future you want a slightly different configuration. With the key differences covered I want to reiterate how the brushes are so very similar. Both have 2 cleaning modes, Daily Clean and Gum Care. A timer, quadpacer and pressure sensor are built into both handles. 2 weeks battery life is possible from the built in lithium-ion battery. 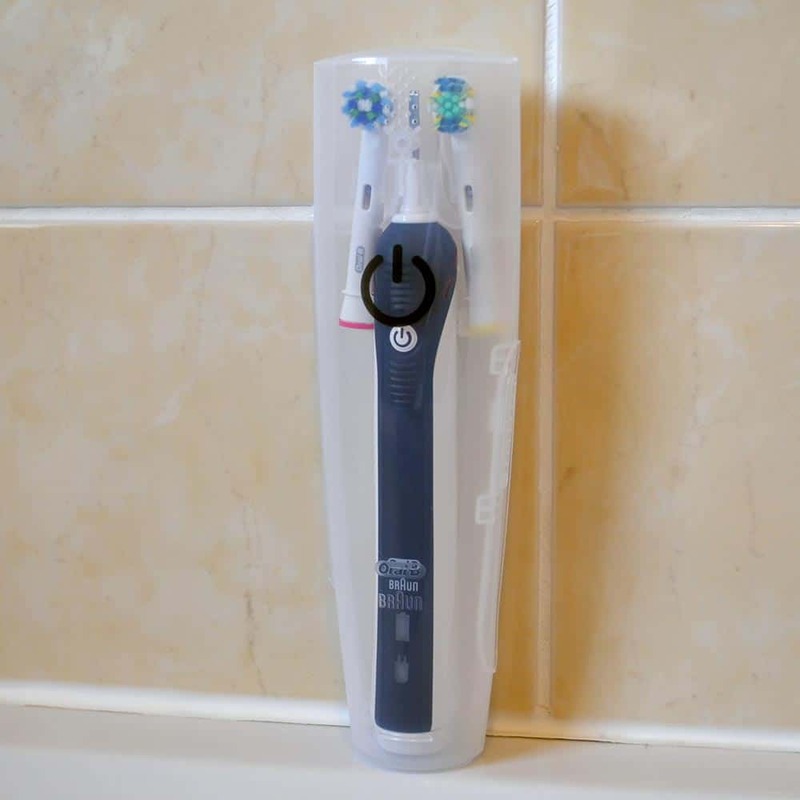 The handle is water resistant and comes with a 2 year warranty, that can be extended to 3 years with either model by simply registering the brush online with Oral-B. In the box, both come with a basic but functional charging stand that connects to the 2 pin socket found in most bathrooms. With the right technique and regular cleaning you will leave your teeth feeling and looking healthier, but if you are using the Pro 2 2000 or 2 2500 on the daily clean or gum care mode, there is no known difference in their actual results. Normally, the Pro 2 2500 is a few pounds more expensive because of the included travel case. You can purchase the travel case separately, this would normally be anywhere between £10-15. Thus if you think you would like or benefit from a travel case it might be worth paying a few pounds more over and above the Pro 2 2000 to benefit from the case. However, for extended periods of time the more premium 2500 has been sold for a few pounds less than the Pro 2 2000, so it in essence makes sense to buy it. Fewer retail stores stock the Pro 2 2500 than the 2000, so it is the 2000 that is more easily accessible, but many online retailers stock both. The price will depend on when and where you buy it and more often than not there will be pennies difference in the price. We generally recommend the Pro 2 2500 as the one to go for as for most this is the better buy. As we have pointed out though with so little between them and the Pro 2 2000 sometimes, much will depend on your preference, time and location of purchase. This is far from a guarantee, but generally, if you buy from Amazon we believe that the difference in price will be such that the 2500 will always be the better buy. For the frequent traveller, the included case can be a real benefit. Ultimately, choose the brush you are most happy with and pay a price you are content with. Thanks. I bought the Pro 2 2000 in a sale and I now know not to worry about it being less than best. Thanks Ray, glad I could help. I recently acquired the 2500 -not sure whether the 2016 or the 2017 model-, however, I ended up returning it, as it didn’t reduce speed upon applying too much pressure, or at least I couldn’t notice; just the visual indicator turning on. Even pressing hard on my hand, I wouldn’t observe any speed reduction; should that be obvious enough? or is it not so obvious? It is not as obvious as you might think it would be. Given that the brush is moving at up to 40,000 times per minute, even a slow down of 10,000 movements is pretty hard to detect. That must be… so thanks for the prompt feedback!